Oracle released its quarterly earnings results on Tuesday, announcing that its revenue had increased about 4% compared with the same quarter last year. In those results and the earnings call, some news emerged, including details on Oracle hardware revenue, Oracle Database 12c and the company's Fusion Applications and cloud business. It's cloud, cloud, cloud. So let me say that one more time: Cloud, cloud, cloud is generally where Fusion is deployed. After a years-long decline, Oracle hardware revenue has increased year over year for two consecutive quarters. Its most recent filing with the Securities and Exchange Commission showed $1.3 billion in hardware revenue for the quarter, up 6.6% from the same quarter last year. Oracle executives attributed the gain to its sales of Engineered Systems, such as Exadata and Exalytics, which grew more than 30%, according to Oracle President Safra Catz. CEO Lawrence Ellison said Oracle will sell its 10,000th engineered system in the next few months and that the company is "well on their way" to replacing IBM System p servers as the leader in high-end computing. Oracle also said that Engineered Systems make up about 30% of its overall hardware revenue and will soon get to 50%. Oracle's claims may have merit, but it has taken a long decline in hardware revenues for the company to hit its valley. In the first quarter after buying Sun Microsystems, Oracle hardware reported $1.8 billion in revenue. It has since been on a long slide down, hitting its low point a year ago. So that may also be a reason why Oracle hardware revenues this quarter look impressive. Whether Oracle hardware can continue to climb out of that valley remains to be seen. Oracle Database 12c has been generally available for almost a year, and at OpenWorld last fall, the company announced an in-memory add-on to the new version. Now we have some idea about when that add-on will be available. The in-memory add-on will allow Oracle Database 12c users to run queries in memory without having to move large volumes of data to a dedicated in-memory database such as Oracle's own TimesTen. Ellison estimated in the earnings call that it would be released during mid-2014, "and we think that's going to accelerate the adoption of 12c a lot." The availability of the in-memory option will help to bring Oracle Database in line with other in-memory database options from competitors such as SAP Hana and Microsoft SQL Server. Most likely, the in-memory add-on will be an extra cost, much as Real Application Clusters and 12c's Multitenant are. And that will require some in-depth calculations for return on investment. In the past, Oracle has sometimes steered away from using the term Fusion Applications, focusing more on the term cloud for its next generation of applications. Company executives didn't do that during the earnings call on Tuesday, but they stressed that Fusion Applications are generally deployed in the cloud, and Oracle encourages that environment for Fusion apps. "I think what you asked was the deployment of Fusion on-premises versus cloud," Oracle President Mark Hurd said in response to a financial analyst's question on the call. "It's cloud, cloud, cloud. So let me say that one more time: Cloud, cloud, cloud is generally where Fusion is deployed." Get the picture? 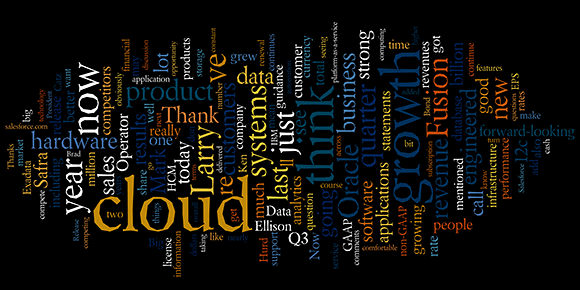 If not, take a look at this graphic created from the Wordle site and based on the transcript from the earnings call on Tuesday. The words more often used are bigger in the picture. Get the picture now? It's cloud, cloud, cloud.